This paper examines how metaphor can be used to shape methodological choice and research design in the exploration of the construction of artist and teacher identity. In doing so, I detail how a ‘painting as research’ metaphor was used to guide my choice and understanding of how to utilise a combined autoethnographic and a/r/tographic methodology within my doctoral study. In investigating the applicability of a ‘painting as research’ metaphor, I was able to identify and explore synergy evident within and across my art and research practices and identities. In doing so, I elaborate upon the metaphoric parallels I drew between my artist, teaching and research practices that enabled me to clarify the research methods utilised within my doctoral study. 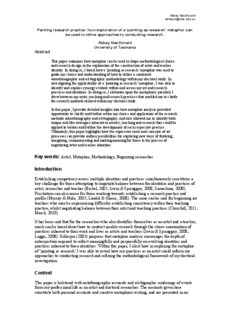 In this paper, I provide detailed insights into how metaphor analysis provided opportunity to clarify and further refine my choice and application of the research methods autoethnography and a/r/tography, and also allowed me to identify both unique and like strategies inherent to artistry, teaching and research that could be applied to bolster and further the development of each respective practice. Ultimately, this paper highlights how the expressive tools and concepts of art processes can provide endless possibilities for exploring new ways of thinking, imagining, communicating and making meaning for those in the process of negotiating artist and teacher identities. artist, metaphor, methodology, beginning researcher.